Very quick delivery. Extremely well packed. Instruction easy to follow.. Would deal with this company again. First class service. Good service and prompt delivery. Battery came in very quick time. Well packed. Easy to follow instructions for filling. Fitted the bike perfectly. I would buy again from this company. Thank you. Excellent delivery service, battery and acid were well packaged. Easy instructions as to filling the battery with the electrolyte. After charging was very impressed with the cranking power on my 650cc single. Just make sure that the voltage stays above 12.06v or, like any other battery, sulfation will occur. 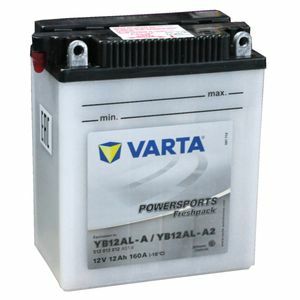 Bought this battery to replace an 8 year old Varta battery. This battery was well packed and once filled with battery acid and charged up it effortlessly turned the bike's engine over. Good quick service with no fuss. Reliable as ever. No problems and fits the BMW F650 fine. Perfect replacement for the old one. It works well. Very good company- will do business again. Fitted my Virago 535 perfectly, quick delivery, easy to fill battery and instalation.